PCB Piezotronics, Inc.: An industry exclusive new ½" (6mm) random incidence microphone, model 377A21 from PCB Piezotronics, Inc. provides accurate response in diffuse field applications where high frequencies, above the human audible range, need to be measured precisely. In a diffuse field, multiple sound pressure waves arrive from various directions simultaneously, from different sources and reflections. The random incidence microphone averages this acoustic input to give an accurate measurement. Due to multiple reflective surfaces in aircraft and automobiles, these microphones are often used to measure cabin noise. Manufacturers assess sound quality to make product improvements that minimize the noise levels that passengers are exposed to. Other common applications for this microphone include environmental monitoring, room acoustics, reverberation room testing and general high pressure and high frequency diffuse field analysis. The 377A21 frequency range, 3 Hz to 25 kHz, not only exceeds the audible range it also avoids overload that can be experienced when a standard high sensitivity (50 mV/Pa) microphones measure pressure over 136 dB. The 377A21 measures up to 160 dB (147 dB with a standard preamplifier) in a ½" package, while maintaining a 19 dBA noise floor. This microphone is a cost effective alternative to a ¼" microphone and preamplifier combination and has a much lower inherent noise. 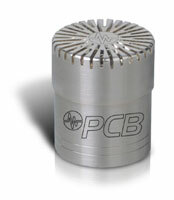 PCB® carries a full complement of prepolarized and externally polarized condenser microphones and preamplifiers. Prepolarized microphones use standard coaxial cables and are ICP® compliant, allowing power supplies to be shared with other ICP® compliant products such as accelerometers, pressure and force sensors. This interchangeability can result in a significant per-channel cost savings as well as reduce test set-up time. PCB products are backed by our best in class warranty and Total Customer Satisfaction policy. Model 377A21 is a stock item and available for immediate shipment. For additional information please visit www.pcb.com/acoustics or contact Mark Valentino, Product Manager, at (866) 816-8892 or email at mvalentino@pcb.com .